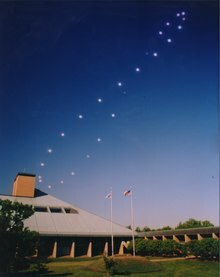 An analemma illustrates the changing position of the Sun over the course of a year, as viewed from a fixed time of day. A year is the orbital period of the Earth moving in its orbit around the Sun. Due to the Earth's axial tilt, the course of a year sees the passing of the seasons, marked by change in weather, the hours of daylight, and, consequently, vegetation and soil fertility. The current year is 2019. In temperate and subpolar regions around the planet, four seasons are generally recognized: spring, summer, autumn, and winter. In tropical and subtropical regions, several geographical sectors do not present defined seasons; but in the seasonal tropics, the annual wet and dry seasons are recognized and tracked. A calendar year is an approximation of the number of days of the Earth's orbital period as counted in a given calendar. The Gregorian calendar, or modern calendar, presents its calendar year to be either a common year of 365 days or a leap year of 366 days, as do the Julian calendars; see below. For the Gregorian calendar, the average length of the calendar year (the mean year) across the complete leap cycle of 400 years is 365.2425 days. The ISO standard ISO 80000-3, Annex C, supports the symbol a (for Latin annus) to represent a year of either 365 or 366 days. In English, the abbreviations y and yr are commonly used. In astronomy, the Julian year is a unit of time; it is defined as 365.25 days of exactly 86,400 seconds (SI base unit), totalling exactly 31,557,600 seconds in the Julian astronomical year. The word year is also used for periods loosely associated with, but not identical to, the calendar or astronomical year, such as the seasonal year, the fiscal year, the academic year, etc. Similarly, year can mean the orbital period of any planet; for example, a Martian year and a Venusian year are examples of the time a planet takes to transit one complete orbit. The term can also be used in reference to any long period or cycle, such as the Great Year. English year (via West Saxon ġēar (/jɛar/), Anglian ġēr) continues Proto-Germanic *jǣran (*jē₁ran). Cognates are German Jahr, Old High German jār, Old Norse ár and Gothic jer, from the Proto-Indo-European noun *yeh₁r-om "year, season". Cognates also descended from the same Proto-Indo-European noun (with variation in suffix ablaut) are Avestan yārǝ "year", Greek ὥρα (hṓra) "year, season, period of time" (whence "hour"), Old Church Slavonic jarŭ, and Latin hornus "of this year". Latin annus (a 2nd declension masculine noun; annum is the accusative singular; annī is genitive singular and nominative plural; annō the dative and ablative singular) is from a PIE noun *h₂et-no-, which also yielded Gothic aþn "year" (only the dative plural aþnam is attested). Although most languages treat the word as thematic *yeh₁r-o-, there is evidence for an original derivation with an *-r/n suffix, *yeh₁-ro-. Both Indo-European words for year, *yeh₁-ro- and *h₂et-no-, would then be derived from verbal roots meaning "to go, move", *h₁ey- and *h₂et-, respectively (compare Vedic Sanskrit éti "goes", atasi "thou goest, wanderest"). A number of English words are derived from Latin annus, such as annual, annuity, anniversary, etc. ; per annum means "each year", anno Domini means "in the year of the Lord". In the International System of Quantities (ISO 80000-3), the year (symbol, a) is defined as either 365 days or 366 days. In the Julian calendar, the average (mean) length of a year is 365.25 days. In a non-leap year, there are 365 days, in a leap year there are 366 days. A leap year occurs every fourth year, or leap year, during which a leap day is intercalated into the month of February. The name "Leap Day" is applied to the added day. The Revised Julian calendar, proposed in 1923 and used in some Eastern Orthodox Churches, has 218 leap years every 900 years, for the average (mean) year length of 7002365242222200000♠365.2422222 days, close to the length of the mean tropical year, 7002365242190000000♠365.24219 days (relative error of 9·10−8). In the year 2800 CE, the Gregorian and Revised Julian calendars will begin to differ by one calendar day. The Gregorian calendar attempts to cause the northward equinox to fall on or shortly before March 21 and hence it follows the northward equinox year, or tropical year. Because 97 out of 400 years are leap years, the mean length of the Gregorian calendar year is 365.2425 days; with a relative error below one ppm (8·10−7) relative to the current length of the mean tropical year (365.24219 days) and even closer to the current March equinox year of 365.242374 days that it aims to match. It is estimated that by the year 4000 CE, the northward equinox will fall back by one day in the Gregorian calendar, not because of this difference, but due to the slowing of the Earth's rotation and the associated lengthening of the day. Historically, lunisolar calendars intercalated entire leap months on an observational basis. Lunisolar calendars have mostly fallen out of use except for liturgical reasons (Hebrew calendar, various Hindu calendars). A modern adaptation of the historical Jalali calendar, known as the Solar Hijri calendar (1925), is a purely solar calendar with an irregular pattern of leap days based on observation (or astronomical computation), aiming to place new year (Nowruz) on the day of vernal equinox (for the time zone of Tehran), as opposed to using an algorithmic system of leap years. A calendar era assigns a cardinal number to each sequential year, using a reference point in the past as the beginning of the era. The worldwide standard is the Anno Domini era (but the label Common Era is preferred by some). It was historically introduced in the 6th century and intended as counting years from the birth of Jesus. The Anno Domini era is given the Latin abbreviation AD (for Anno Domini "in the year of the Lord"), or alternatively CE for "Common Era. Years before AD 1 are abbreviated BC for Before Christ or alternatively BCE for Before the Common Era. Year numbers are based on inclusive counting, so that there is no "year zero". In the modern alternative reckoning of Astronomical year numbering, positive numbers indicate years AD, the number 0 designates 1 BC, −1 designates 2 BC, and so on. Financial and scientific calculations often use a 365-day calendar to simplify daily rates. A fiscal year or financial year is a 12-month period used for calculating annual financial statements in businesses and other organizations. In many jurisdictions, regulations regarding accounting require such reports once per twelve months, but do not require that the twelve months constitute a calendar year. For example, in Canada and India the fiscal year runs from April 1; in the United Kingdom it runs from April 1 for purposes of corporation tax and government financial statements, but from April 6 for purposes of personal taxation and payment of state benefits; in Australia it runs from July 1; while in the United States the fiscal year of the federal government runs from October 1. An academic year is the annual period during which a student attends an educational institution. The academic year may be divided into academic terms, such as semesters or quarters. The school year in many countries starts in August or September and ends in May, June or July. In Israel the academic year begins around October or November, aligned with the second month of the Hebrew Calendar. Some other schools, including some in the United States, have four marking periods. Some schools in the United States, notably Boston Latin School, may divide the year into five or more marking periods. Some state in defense of this that there is perhaps a positive correlation between report frequency and academic achievement. In the Unified Code for Units of Measure, the symbol, a (without subscript), always refers to the Julian year, aj, of exactly 7007315576000000000♠31557600 seconds. The SI multiplier prefixes may be applied to it to form ka (kiloannus), Ma (megaannus), etc. The relations among these are considered more fully in Axial precession (astronomy). The sidereal year is the time taken for the Earth to complete one revolution of its orbit, as measured against a fixed frame of reference (such as the fixed stars, Latin sidera, singular sidus). Its average duration is 7002365256363004000♠365.256363004 days (365 d 6 h 9 min 9.76 s) (at the epoch J2000.0 = January 1, 2000, 12:00:00 TT). This term is sometimes erroneously used for the draconic or nodal period of lunar precession, that is the period of a complete revolution of the Moon's ascending node around the ecliptic: 7001186128159320000♠18.612815932 Julian years (7003679833101900000♠6798.331019 days; at the epoch J2000.0). The lunar year comprises twelve full cycles of the phases of the Moon, as seen from Earth. It has a duration of approximately 354.37 days. Muslims use this for celebrating their Eids and for marking the start of the fasting month of Ramadan. A Muslim calendar year is based on the lunar cycle. The vague year, from annus vagus or wandering year, is an integral approximation to the year equaling 365 days, which wanders in relation to more exact years. Typically the vague year is divided into 12 schematic months of 30 days each plus 5 epagomenal days. The vague year was used in the calendars of Ethiopia, Ancient Egypt, Iran, Armenia and in Mesoamerica among the Aztecs and Maya. It is still used by many Zoroastrian communities. A heliacal year is the interval between the heliacal risings of a star. It differs from the sidereal year for stars away from the ecliptic due mainly to the precession of the equinoxes. The Sothic year is the interval between heliacal risings of the star Sirius. It is currently less than the sidereal year and its duration is very close to the Julian year of 365.25 days. The TT subscript indicates that for this formula, the Julian date should use the Terrestrial Time scale, or its predecessor, ephemeris time. Tidal drag between the Earth and the Moon and Sun increases the length of the day and of the month (by transferring angular momentum from the rotation of the Earth to the revolution of the Moon); since the apparent mean solar day is the unit with which we measure the length of the year in civil life, the length of the year appears to decrease. The rotation rate of the Earth is also changed by factors such as post-glacial rebound and sea level rise. 365 Vague, and a common year in many solar calendars. 366 Leap in many solar calendars. The Galactic year is the time it takes Earth's solar system to revolve once around the galactic center. It comprises roughly 230 million Earth years. In the International System of Quantities the symbol for the year as a unit of time is a, taken from the Latin word annus. ka (for kiloannum) – a unit of time equal to one thousand, or 103, years, or 1 E3 yr, also known as a millennium in anthropology and calendar uses. The prefix multiplier "ka" is typically used in geology, paleontology, and archaeology for the Holocene and Pleistocene periods, where a non−radiocarbon dating technique: e.g. ice core dating, dendrochronology, uranium-thorium dating, or varve analysis; is used as the primary dating method for age determination. If age is determined primarily by radiocarbon dating, then the age should be expressed in either radiocarbon or calendar (calibrated) years Before Present. Ma (for megaannum) – a unit of time equal to one million, or 106, years, or 1 E6 yr. The suffix "Ma" is commonly used in scientific disciplines such as geology, paleontology, and celestial mechanics to signify very long time periods into the past or future. For example, the dinosaur species Tyrannosaurus rex was abundant approximately 66 Ma (66 million years) ago. The duration term "ago" may not always be indicated: if the quantity of a duration is specified while not explicitly mentioning a duration term, one can assume that "ago" is implied; the alternative unit "mya" does include "ago" explicitly. It also written as "million years" (ago) in works for general public use. In astronomical applications, the year used is the Julian year of precisely 365.25 days. In geology and paleontology, the year is not so precise and varies depending on the author. Ga (for gigaannum) – a unit of time equal to 109 years, or one billion years. "Ga" is commonly used in scientific disciplines such as cosmology and geology to signify extremely long time periods in the past. For example, the formation of the Earth occurred approximately 4.54 Ga (4.54 billion years) ago. Ta (for teraannum) – a unit of time equal to 1012 years, or one trillion years. "Ta" is an extremely long unit of time, about 70 times as long as the age of the universe. It is the same order of magnitude as the expected life span of a small red dwarf. In astronomy, geology, and paleontology, the abbreviation yr for years and ya for years ago are sometimes used, combined with prefixes for thousand, million, or billion. They are not SI units, using y to abbreviate the English "year", but following ambiguous international recommendations, use either the standard English first letters as prefixes (t, m, and b) or metric prefixes (k, M, and G) or variations on metric prefixes (k, m, g). In archaeology, dealing with more recent periods, normally expressed dates, e.g. "22,000 years ago" may be used as a more accessible equivalent of a Before Present ("BP") date. Use of mya and bya is deprecated in modern geophysics, the recommended usage being Ma and Ga for dates Before Present, but "m.y." for the duration of epochs. This ad hoc distinction between "absolute" time and time intervals is somewhat controversial amongst members of the Geological Society of America. ^ "SI units". IAU. Retrieved February 18, 2010. (See Table 5 and Section 5.15.) Reprinted from: Wilkins, George A. (1989). "The IAU Style Manual" (PDF). IAU Transactions. XXB. ^ Shields, Miriam Nancy. (1924). "The New Calendar of the Eastern Churches, Popular Astronomy, Vol. 32, p. 407. Courtesy NASA Astrophysics Data System. ^ Richards, E.G. (2013). "Calendars". In Urban, S.E. ; Seidelmann, P.K. Explanatory Supplement to the Astronomical Almanac (PDF) (3rd ed.). Mill Valley, CA: University Science Books. pp. 585, 590. ISBN 978-1-891389-85-6. Richards does not explicitly state Anno Domini is the worldwide standard, but does state on page 585 the Gregorian calendar is used throughout the world for secular purposes; the Gregorian calendar is used with the Anno Domini era. ^ International Earth Rotation and Reference System Service. (2010).IERS EOP PC Useful constants. ^ "longitude, ecliptic" and "dynamical equinox". (2018). In "Glossary", The Astronomical Almanac Online. United States Naval Observatory. ^ Astronomical Almanac for the Year 2011. Washington and Taunton: U.S. Government Printing Office and the U.K. Hydrographic Office. 2009. p. M18 (Glossary). ^ Astronomical Almanac for the Year 2011. Washington and Taunton: US Government Printing Office and the UK Hydrographic Office. 2009. pp. A1, C2. ^ Astronomical Almanac for the Year 2010. Washington and Taunton: U.S. Government Printing Office and the U.K. Hydrographic Office. 2008. p. B3. ^ "Science Bowl Questions, Astronomy, Set 2" (PDF). Science Bowl Practice Questions. Oak Ridge Associated Universities. 2009. Archived from the original (PDF) on March 7, 2010. Retrieved December 9, 2009. ^ a b c Russ Rowlett. "Units: A". How Many? A Dictionary of Units of Measurement. University of North Carolina. Retrieved January 9, 2009. ^ a b c d "AGU Editorial Style Guide for Authors". American Geophysical Union. September 21, 2007. Archived from the original on July 14, 2008. Retrieved January 9, 2009. ^ a b c North American Commission on Stratigraphic Nomenclature (November 2005). "North American Stratigraphic Code". The American Association of Petroleum Geologists Bulletin (Article 13 (c) ed.). 89 (11): 1547–1591. doi:10.1306/07050504129. ^ Ambler Thompson; Barry N. Taylor (2008). "Special Publication 811 – Guide for the Use of the International System of Units (SI)" (PDF). National Institute of Standards and Technology (NIST). para 8.1. ^ "ISO 80000-3:2006, Quantities and units". Geneva: International Organization for Standardization. 2006. Part 3: Space and time. ^ Gunther Schadow; Clement J. McDonald. "Unified Code for Units of Measure". Archived from the original on May 20, 2008. ^ Norman E. Holden; Mauro L. Bonardi; Paul De Bièvre; Paul R. Renne & Igor M. Villa (2011). "IUPAC-IUGS common definition and convention on the use of the year as a derived unit of time (IUPAC Recommendations 2011)". Pure and Applied Chemistry. 83 (5): 1159–1162. doi:10.1351/PAC-REC-09-01-22. ^ a b Celeste Biever (April 27, 2011). "Push to define year sparks time war". New Scientist. 210 (2810): 10. Bibcode:2011NewSc.210R..10B. doi:10.1016/S0262-4079(11)60955-X. Retrieved April 28, 2011. ^ P. Belli; et al. (2007). "Investigation of β decay of 113Cd". Phys. Rev. C. 76 (6): 064603. Bibcode:2007PhRvC..76f4603B. doi:10.1103/PhysRevC.76.064603. ^ F.A. Danevich; et al. (2003). "α activity of natural tungsten isotopes". Phys. Rev. C. 67 (1): 014310. arXiv:nucl-ex/0211013. Bibcode:2003PhRvC..67a4310D. doi:10.1103/PhysRevC.67.014310. ^ North American Commission on Stratigraphic Nomenclature. "North American Stratigraphic Code (Article 13 (c))". (c) Convention and abbreviations. – The age of a stratigraphic unit or the time of a geologic event, as commonly determined by numerical dating or by reference to a calibrated time-scale, may be expressed in years before the present. The unit of time is the modern year as presently recognized worldwide. Recommended (but not mandatory) abbreviations for such ages are SI (International System of Units) multipliers coupled with "a" for annus: ka, Ma, and Ga for kilo-annus (103 years), Mega-annus (106 years), and Giga-annus (109 years), respectively. Use of these terms after the age value follows the convention established in the field of C-14 dating. The "present" refers to AD 1950, and such qualifiers as "ago" or "before the present" are omitted after the value because measurement of the duration from the present to the past is implicit in the designation. In contrast, the duration of a remote interval of geologic time, as a number of years, should not be expressed by the same symbols. Abbreviations for numbers of years, without reference to the present, are informal (e.g., y or yr for years; my, m.y., or m.yr. for millions of years; and so forth, as preference dictates). For example, boundaries of the Late Cretaceous Epoch currently are calibrated at 63 Ma and 96 Ma, but the interval of time represented by this epoch is 33 m.y. ^ "Time Units". Geological Society of America. Archived from the original on June 16, 2016. Retrieved February 17, 2010.